There are a few things brewing at Waxxi. One of them, [I] can talk about here. Others will have to wait, just a while longer. While we’ll continue our typical 30+ minute interactive podcasts with very interesting people, we’ll also begin a shorter version, called the Sweet Spot. The idea is micro-consumption: an interesting snapshot of cool, smart people which you can read, listen to, or watch in five minutes (or so). We’ll be announcing a lineup soon, but here we’ll let you in on one of our first guests: Twitter co-founder, and genius , Biz Stone. Have a question for Biz? Simply leave a comment here, DM me on Twitter here, or message me on Facebook here (guest suggestions may also be submitted in the same manner). Originally blogged at Socially Speaking. This was a great discussion. You can listen to, and download, it here. Bonus: a few other places where Seth is popping up online. Well, wait a second. Yahoo! makes millions and millions of dollars every day. They have more register users, I think, than just about any other site in the world. And, they deliver huge amounts of information on finance and everything else. Millions and millions of people have Yahoo! mail. If someone wanted to hand me the keys to Yahoo!, I’d be happy to show up. They’re not doomed, by any stretch of the imagination. The real question, I think, should be: what’s Yahoo!’s next Dip, and how do they get through it? Is Yahoo! on a dead end in which they’re going to keep cranking out money but not become a superstar in something new. Or, are there Dips that the people at Yahoo! could focus on and put their huge resources behind, and push through. Or, is it a better strategy for them to do forty things, and hope that one of them pops? And, based on what I’ve said so far today … the way you win on the Internet and everywhere else is to find an area that people are going to choose to talk about, overwhelm it, push through the Dip and then erect a barrier behind you - what I call the Valley of Death - so it’s harder for the Microsofts and the Googles to catch up with you. More, transcribed from last week's Waxxi 'Cast with Seth. And so, I wouldn't have spent that money. I think, if your goal is to reach investors and let them wake up and say 'Wait, there's more than one search engine in the world. Maybe we should buy the stock,' that's a different story. But if you think that putting a billboard up on 38th St. and West Side Highway in New York that says, "The Unabomber Hates the Algorithm" -- I don't get that. The bigger question, is what would you do if you’re trying to compete with Google? And I think the answer is, you find smaller Dips where you can set up mini-dynasties. Off the top of my head, I would build the best search engine in the world for high school students. So that if you’re writing a paper on any topic, this search engine will work five times better, and five times faster, than Google – because it will filter out all sorts of extraneous stuff and always give you the right answer when you type in “J. D. Salinger” or “Fidel Castro” or whatever. If you built that, you could get through that Dip. You could win in the high school homework arena. Why? Because high school students will tell each other about it. And if you do, you’ve just put a hook into an entire generation of millions of people, who, four years from now are going to be in college, and four years after that are going to be starting important jobs. That's a Dip that's attainable. Whereas the Dip of, 'Well, our algorithm's a little bit better. How do we make a better search engine?' I just don't know how to do that. They may very well be smarter than me, but I don't know how to do that. "What was your biggest Dip?" I've had lots and lots of Dips, which is really lucky for me. There are plenty of people I went to business school with who have been on a dead end ever since. There are plenty of people who I worked with at my first job, who have been at a dead end ever since. What I have tried to do is seek out Dip after Dip. Now, there have been a few times when I've quit in the Dip and regretted it. There have been a few times when I almost quit in the Dip, and managed to just squeak through. Just before I sold Yoyodyne to Yahoo in 1998, the good news is the day before we sold, we were profitable which was very unusual in those days. The bad news is that in the six weeks before we sold, there were three occasions where we almost missed payroll. We were within an hour of not having the money in the bank to pay our employees. And it would have been really easy in those days to give up. To look around at the well-funded companies that had raised twenty or forty or eighty million dollars. We had raised four. To look at the companies in California that were getting great deals and hook-ups because of who they knew, and we were in New York and knew no one. And, it would have been easy in the pressure of the moment to say, "Well, we gave it a good try. Let's go home." I'm really glad we stuck that Dip out. The Dip hit the New York Times bestseller list last week. If you'd like to register, go here (but we're rapidly running out of space, so hurry!) And, thanks to everyone who signed up to be a part of the conversation. Talk to you soon. Update: Registration is open, and details are now posted. 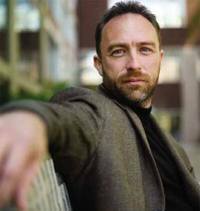 Sneak preview: Waxxi's next interactive podcast guest will be Jimmy Wales, on April 5, 2007. 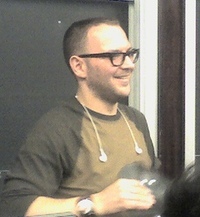 In addition to being founder of Wikipedia, Jimmy is also co-founder and chairman of Wikia. I recently went to see him talk at NYU (on Free Culture, Transparency and Search), and learned a great deal about him, and about the project which is consuming the bulk of his time, Wikia Search. Like Waxxi's other guests -- Michael Arrington, Robert Scoble and Cory Doctorow -- Jimmy has made the infamous Forbes Top 25 Web Celebrities for 2007 list, coming in at number 12. But What is so impressive about this American Internet entrepreneur is the sheer impact of his vision. Wikipedia has had a profound effect on our society. Tim O'Reilly described it well when he visually depicted the evolution of an entry on Wikipedia based on the number of human attributions. And by comparing the (skyrocketing) growth of Wikipedia to that of (flatlined) Britannica. So Wikia, the for-profit sister site to Wikipedia, is closely tracking the early growth of Wikipedia in terms of new article generation. The obvious conclusion is that what worked for Wikipedia may work for Wikia, too. Certainly the same forces of user generated content and community are in play. Wikia Search, in at least one person's opinion, has a very good chance at disrupting the world of search by making it human-powered. There will certainly be a lot to talk about, and I hope you can join us for the conversation. The details will be announced shortly on Waxxi's site, where you'll be able to register for the live event. We're pretty excited about this. My good friend Jackie Danicki says it best, in the title to her post about Waxxi's next event: Talk to Cory Doctorow. That's all it is. A global conversation, open to anyone we can fit in (within reason). It's a lot of fun, and I hope you can join in. Details are here. Cory's blogged it on Boing Boing and Craphound, too. Cool! Cory Doctcorow makes my brain hurt. But in a good way. A very good way. That's Cory after Friday night's Free Culture @ NYU talk: State of the Copyfight 2007: Looking up, not out of the woods yet. He's also a sci-fi writer and activist for our rights, when it comes to the world of copyright and DRM. Here's a video of him talking up DRM and self-determination, courtesy of Loic Le Meur (and Google Video). Side note: Interestingly enough, I was one of the people Cory was emailing from the conference, which we all three (plus about 297 others) attended. In the email, Cory agreed to be Waxxi's next guest, on an interactive podcast in February. More over here, shortly. In the meantime, check out his new short story collection, Overclocked.